I haven’t written about one of my very expensive but ultimately rewarding hobbies for a while, so I will try to correct this. You see, I like espresso and espresso based drinks. One of these days I’ll write a long post about everything that I ever learned about making them, but for now, here’s a short progress report. There are hundreds of cooking shows these days. Even the British, famous for their indigestible cuisine, field two awesome shows: The Naked Chef and Ramsay’s Kitchen Nightmares. All of a sudden, London is referred to “City of Chefs.” In any case, I am sure that both Jamie Oliver and Gordon Ramsay prepare very tasty meals in their restaurants. But I am also pretty sure that if you order an espresso or a cappuccino there, you’ll get the undrinkable crud. Jamie Oliver, for instance has a FrancisFrancis! 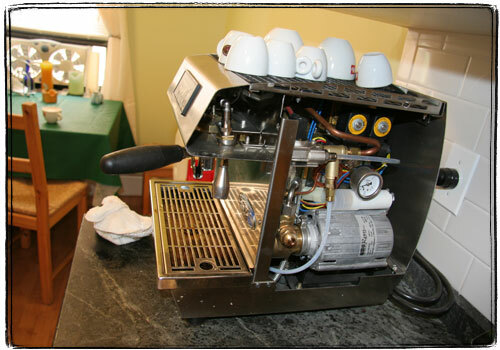 – a beautifully designed, but highly mediocre espresso machine in his home kitchen. 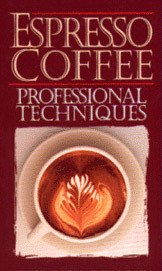 Would one show about coffee and coffee training for celebrity chefs and their restaurant staff be too much to ask for? As my financial means increased, I’ve progressed through a series of espresso machines. For a year or so I’ve been a proud owner of a Reneka Techno. It’s a common choice amongst espresso enthusiasts who always wanted a La Marzocco machine, but finally gave up, as new ones cost too much (around 6K) and used ones are hard to come by and troublesome. The scarcity of used La Marzocco machines is a mystery to me – Starbucks replaced almost all machines that it used to own with superautomatics of unknown to me make, reportedly forcing the closure of the US La Marzocco factory. Where did they all go? Anyway, strange as it is, but a French company, not an Italian one is making a machine that mostly replicates a La Marzocco for home users. So, what separates this machine from hundreds of competing espresso makers? Well, for starters it uses a rotary pump instead of the most common vibratory one. Rotary pumps give a steady pressure, unlike vibratory ones that provide the same pressure in a series of very rapid pulses. This is similar to analogue vs. digital sound, and just slightly less controversial, as the results are easier to compare. For the record, I like analog sound better too. The second highly desirable feature is the separate high powered steam/water boilers. Add to that a digital temperature control circuit tunable to 1F and you got yourself a great machine. With this little bit of digital trickery you get in-boiler temperature stability that the bigger machines get through great size and painstaking adjustment. The temperature stability at the group (the coffee holder) is another question altogether, but it’s not bad there too. Of course, to get all that you have to suffer some difficulties – like having a 220V outlet installed. This is not too difficult – you just need to have access to two 120V lines on a different phase and have your electrician put in a special circuit breaker. You also need a direct water connection, as rotary pump machines don’t have water tanks and need to take in water at water line pressure. This is not too difficult as well – you need to have your plumber to lead a flexible copper water line from the sink. If you install the machine near the sink, you can also tie the coffee machine’s drain into the sink drain. I am not as lucky – my machine drains into a big vase. Here is my Reneka Techno with the side cover removed. You can see the pump as well as the badly placed pressure gauge. Pressure is adjustable, mine is set at about Schomer-recommended 8.5 bar. 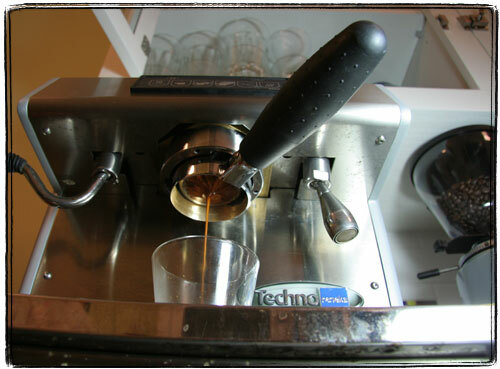 A new trend in espresso shot-pulling is the so-called naked portafilters. Techno came with an extra portafilter, which I had modified at Home-Espresso.com for only $25. The idea is that you get to see the cream formation and flow of espresso though the filter bottom, noting the evenness of extraction. 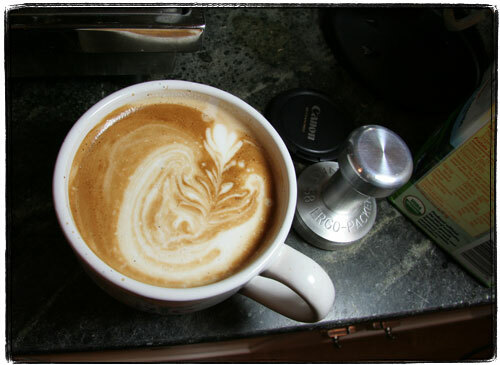 Also, crema touches fewer surfaces, ending up mostly in the cup. 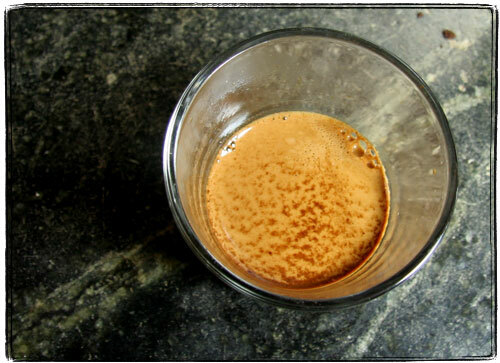 I’ve ordered some coffee from Victorola, this is a shot of their Streamline Espresso. The crema looks a little light, but espresso did not taste sour at all. Is that the mysterious “tiger flecking“? I don’t know. In any case, this was a trial shot, I’ll keep playing with my new toy and new coffees from Victorola. I am sad to announce my continuing suckage at the fine craft of latte art. Look and laugh at this misshapen rosetta. Ewww. Well, practice makes perfect. Serious espresso making requires serious reading. David Shomer’s book is a classic that must be read by every aspiring barrista. 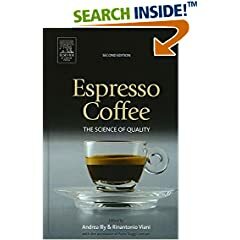 Espresso Coffee : The Science of Quality by Rinantonio Viani, Andrea Illy (yes, that Illy) is a sophisticated scientific and scholarly work about espresso. It’s expensive at seventy something dollars. But when you spend that much on coffee machines, coffee accessories and coffee, what’s 70-80 bucks more for a good book? Previous PostPrevious What’s Wrong With Frank the Goat?